Whatsapp has just updated its app on Android to version 2.12.45. The new version adds the long awaited ability to backup all Whatsapp conversations to Google Drive, early March DroidApp already discovered that WhatsApp was working on integrating Google Drive into the popular messaging app which recently hit the 800 Million user milestone. 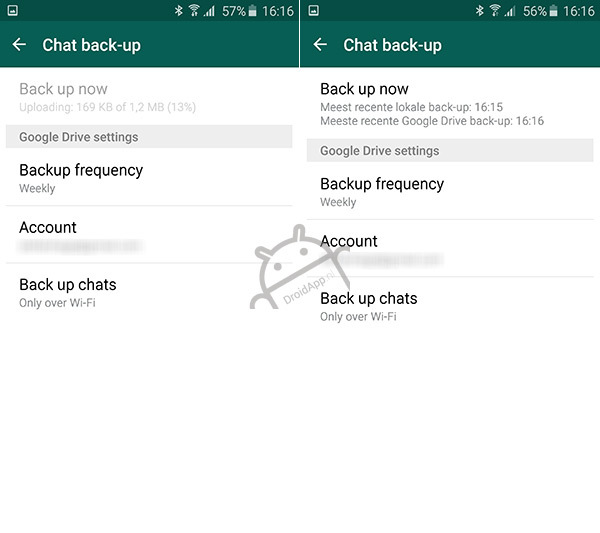 Google Drive Backups don’t only include conversations but also all media sent via the chat like videos, audio messages and photos. You can also change the frequency of which the backup is made (daily, weekly or monthly) and if it should make it only when connected to Wifi or also Cellular data. Click on the “Backup Now” button to create your first backup.